The same day that my book was released the KIPP Foundation PR machine was ready with a false and deprecating statement about me and the contents of my book. 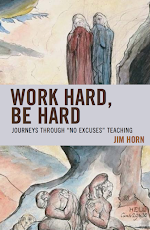 Education blogger Jim Horn has released a book called “Work Hard, Be Hard: Journeys Through ‘No Excuses’ Teaching.” For his book, Horn draws on old news coverage of KIPP and interviews with unnamed former KIPP teachers. While we respect Mr. Horn’s right to his opinions, we take exception to his characterization of the facts. The book continues the rhetoric we have seen for over a decade on Mr. Horn’s blog, where he has compared KIPP schools to concentration camps and accused KIPP of practicing eugenics. 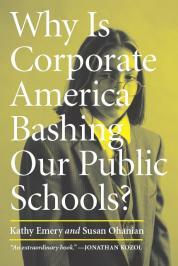 The book relies heavily on accounts that do not reflect KIPP’s current reality. For example, Mr. Horn discusses at length a former KIPP school in Fresno, CA that closed permanently in 2009. When reports arose of the school mishandling student discipline, the KIPP Foundation moved swiftly in 2009 to initiate a leadership change and the school’s closure. KIPP has a long track record of providing high-quality education for students and a supportive, rewarding environment for teachers. Independent research demonstrates that KIPP students are making substantial learning gains over time. We invite those interested in learning about KIPP to visit one of our schools and see our teachers and students in action. Before I address the substantive issues and inaccuracies in KIPP's smear, let me say a couple of things about my qualifications to be an "education blogger." 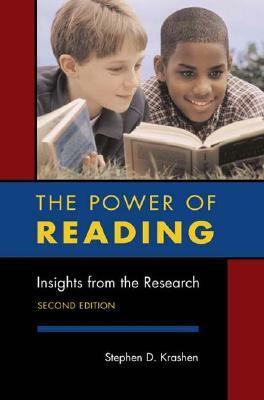 I hold a PhD from the University of Tennessee in Curriculum and Instruction with a concentration in Social Foundations, and I am fully certified as a school administrator (7-12), language arts teacher (7-12), and school librarian (K-12. I have over twenty years of successful teaching experience in K-12, and I achieved the highest level possible on Tennessee's now-defunct Career Ladder. For the last twenty years, I have taught at six different institutions of higher education, and I am currently a tenured full professor. I have taught educational foundations and research at the undergraduate, Masters, and doctoral levels from Massachusetts to Louisiana and presented at national and international conferences. I have published widely in top ranked peer-reviewed journals, magazines, newspapers, and yes, blogs. I have published two books in the past four years, and I am working on a third, now that my commitment to share the stories of former No Excuses teachers has been delivered to my publisher. The KIPP Foundation inaccurately states that my book depends upon "old news coverage" and "interviews with unnamed former KIPP teachers." While it is true that my book does not reference the latest high-profile KIPP abuse cases from St. Louis and New Orleans, I do cite many news stories, features, commentaries, and research findings up through most of 2015. In fact, I was glad to be able to share the 2015 New York Times ground-breaking story on student abuse at Success Academy, and my book ends with a commentary by a black parent published in the Washington Post in 2013. 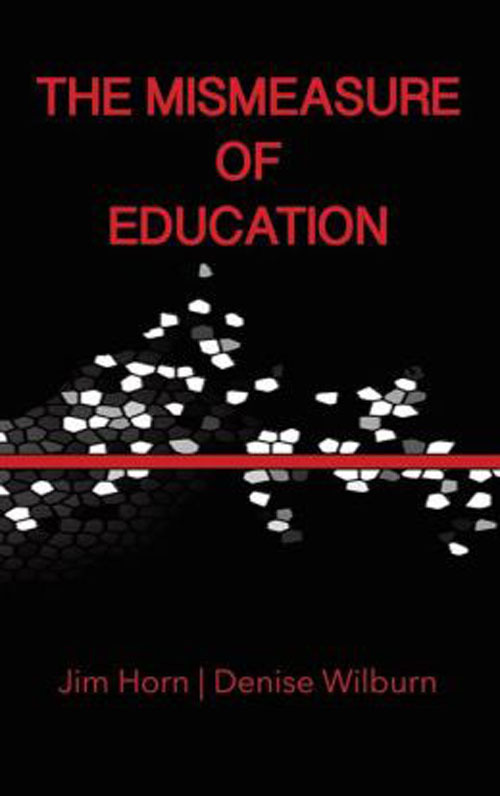 In response to my book and to other accounts of abusive and dehumanizing schooling practices, the No Excuses education industry has launched a campaign to try to convince the public that their soul-crushing paternalistic practices have been discontinued. KIPP goes so far as to say that their zero tolerance policies have been phased out since 2010. It must be noted that all of the narratives collected for my book from in-depth interviews recount many disturbing events that have occurred in No Excuses schools after 2010. And if we can believe the handful of reports from news sources that reach the light of day, we must concede that the systematic abuse continues. In their statement above, the KIPP Foundation refers to the KIPP Fresno school that was closed in 2009 after Fresno Unified School District made public an independent investigation on abuse allegations at KIPP Fresno that go back to 2004. KIPP offers this inaccurate rendering of events: "When reports arose of the school mishandling student discipline, the KIPP Foundation moved swiftly in 2009 to initiate a leadership change and the school’s closure." Sadly for KIPP Fresno students, we learn from the 63 page "Notice to Cure and Correct Violation" issued in 2008 that the KIPP Foundation had known about the allegations against its principal, Mr. Tschang, for years before the Fresno Bee broke the story in early 2009. 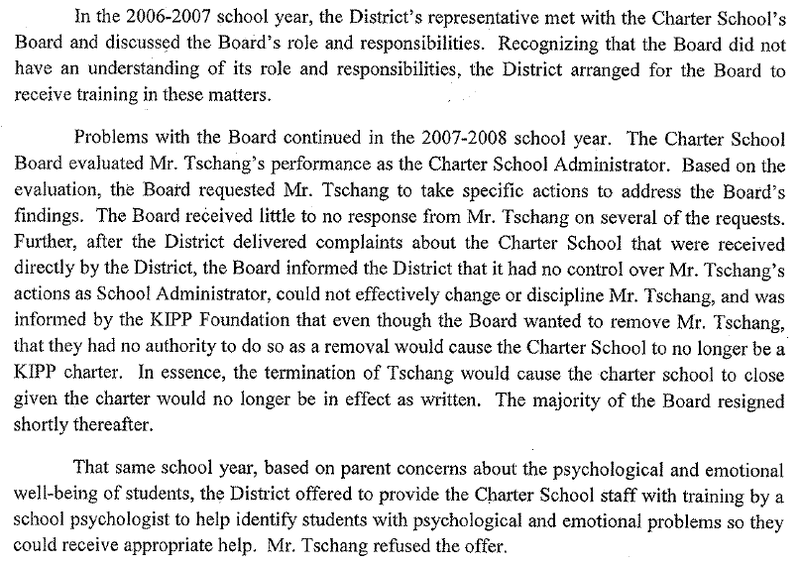 According to the Fresno Bee (stories preserved by Susan Ohanian), KIPP never asked for Tschang's resignation. 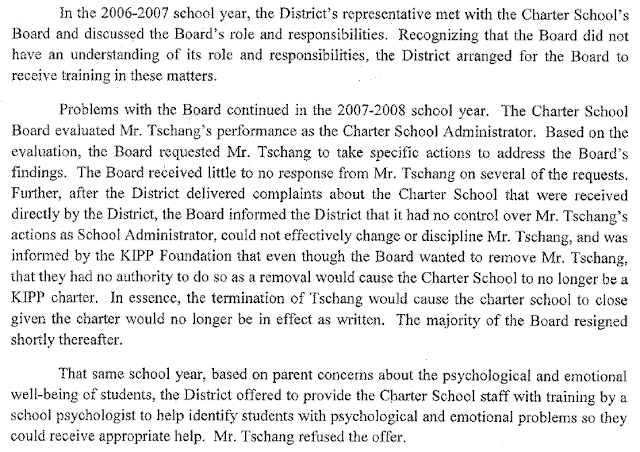 In fact, KIPP did not seek Tschang's resignation after allegations became known. As for the anonymity of the former No Excuses teachers interviewed for Work Hard, Be Hard..., every teacher that I talked with requested their identities be withheld, even though one former Brooklyn Ascend teacher has, since, allowed her name to be used. She has written publicly about her experience as well. All the former KIPP teachers expressed concern for reprisals from the No Excuses corporations they had given so much to while teaching for them. As a researcher, I have always offered participants the choice of remaining anonymous. Verbatim transcripts remain in my possession. There’s nothing wrong with thinking outside of the KIPP values but you weren’t allowed to….There’s one leader, there’s a group of people who are just in it following a day to day routine that’s exactly the same. . . .And you either hang in there or you drop out. The ones that are hanging in are barely hanging in. No one is just bright and cheery and coming to work happy. It’s like they’re coming to work and from the minute they walk in, they are screaming and yelling. . . .One thing the school leader worked on was—you have to smile. If you’re not smiling, something’s wrong. . . . No one was smiling. During my research I made repeated attempts to visit KIPP schools in Memphis. I even asked Washington Post blogger and KIPP supporter, Jay Mathews, if he could help. Even Jay struck out, as I recount here. Finally, KIPP seems particularly hostile to having its practices and ideology being compared with any practice from the eugenics movement, which had as one of its principal aims the containment and sterilization of those citizens deemed unfit. While KIPP is not engaged in trying to sterilize its students, I continue to view KIPP's segregative focus on altering poor children's psychological and neurological schemas in order to make them immune to the effects of poverty as creepily reminiscent of the well-intentioned and "progressive" dream of the eugenics era--a dream that ended in global nightmare. Why would charters want their practices examined under a microscope? They would much prefer to continue to spin their make-believe research usually called a public relations campaign. I'm about to graduate in May and after receiving an invitation to interview at a KIPP school recently, I received a folder of candidate resources where essentially all of their procedures were spelt out. I was confused by whether I was looking at a juvenile detention center or a school? I started doing some research and came across your blog, wow. How can these places exist?